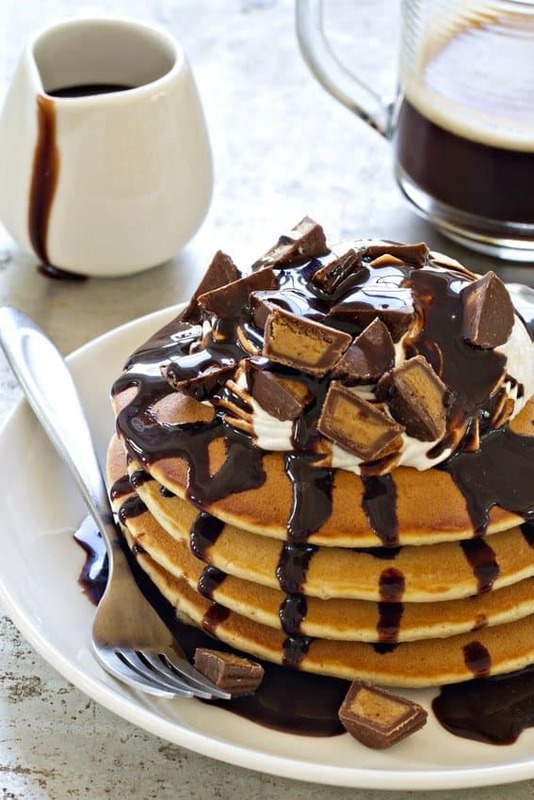 Peanut Butter Cup Pancakes are every peanut butter lover’s dream come true. Loaded with whipped cream, chocolate sauce and mini peanut butter cups – who could resist? I like to think that I’m a practical baker and cook, despite the fact that I’ve shared crazy indulgent desserts like S’mores Waffle Sundaes and Oreo Cheesecake here on My Baking Addiction. One thing that we always keep pretty basic is breakfast. It’s either toast and an over-easy egg or a bowl of oatmeal with fresh berries – except on Sundays. Because Sundays in our house always equal pancakes or on occasion French Toast. I’m typically up a bit earlier than Eric and Elle, so I usually enjoy a cup of coffee, check emails and then get our Sunday morning breakfast started. Fluffy pancakes drenched in real maple syrup and oven-crisped bacon – it’s become a ritual. But lately I’ve been getting experimental with our Sunday morning stack. Topping them with homemade blueberry sauce, adding in pecans and brown sugar, and now these Peanut Butter Cup Pancakes. 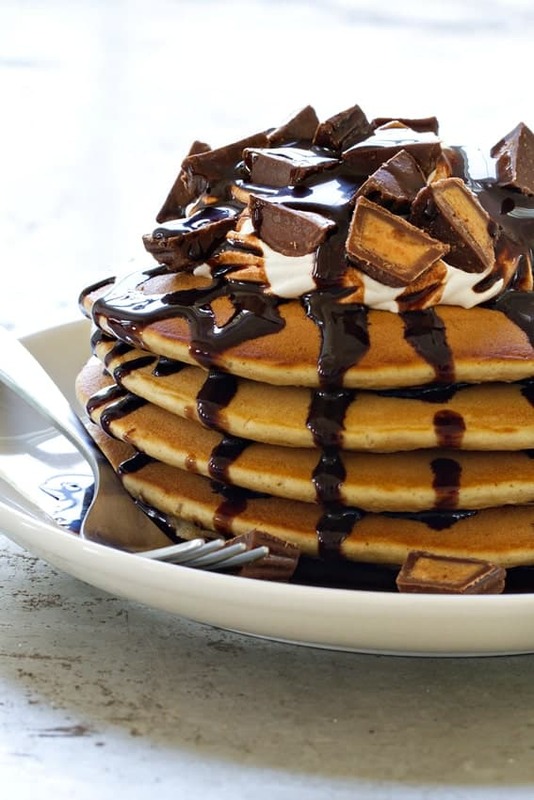 Yep, you read that correctly – Peanut Butter Cup Pancakes. And you have Karly from Buns In My Oven to thank for this delectable creation. Karly’s first cookbook, Stack Happy is loaded with 70 amazing flapjack recipes for breakfast, dinner and dessert. From fruity pancakes for breakfast to Sloppy Joe Corn Cakes for dinner, Stack Happy has a flapjack recipe for every pancake lover. Peanut Butter Cup Pancakes are over-the-top in best kind of way. 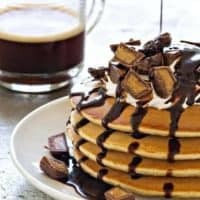 Delicious peanut buttery batter is griddled up to golden brown perfection and topped with whipped cream, chocolate sauce and mini peanut butter cups. 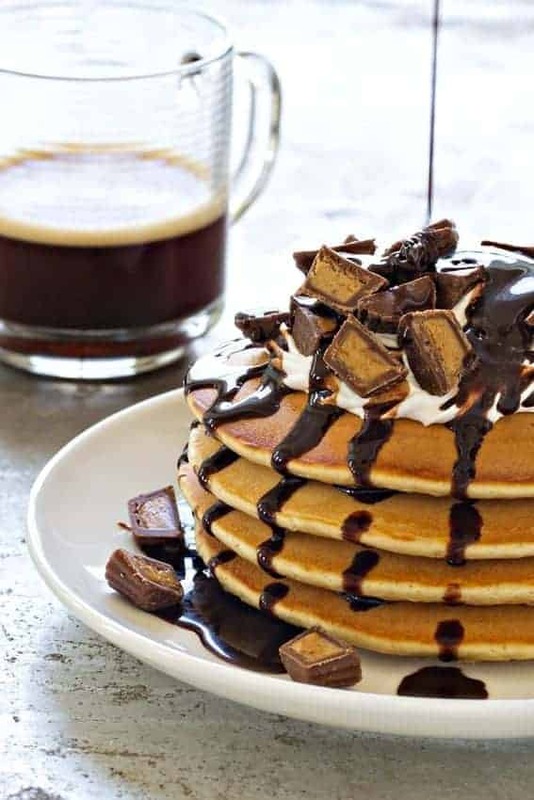 Whether you serve these up for brunch on a lazy Sunday or as a decadent mid-week dessert, I’m pretty certain they’ll make you happy – Stack Happy! Love pancakes as much as we do? Be sure to check out my post on Homemade Bisquick. Pancakes are never a hard thing to put together, but with the mix on hand, all you need are the wet ingredients and mix-ins, and you’re ready to go. In a small bowl, whisk together the buttermilk, egg, and peanut butter. Spray your cooking surface with non-stick cooking spray and place ¼ cup of the pancake batter in the pan. The batter is very thick and will need spread a bit with the back of a spoon, spatula, or your ¼ cup measuring cup. Sprinkle immediately with a few pieces of chopped peanut butter cups. Use a spoon to spread a bit of the batter over the candy pieces. Cook for 3 minutes per side or until cooked through. Repeat with remaining pancakes.